Out of Brakes is an arcade type game in which you maneuver a car down a speed way, avoiding some obstacles, destroying other obstacles, and gaining points in order to accumulate all possible vehicles and drivers! This free app game features Minecraft-like graphics that seem to pop off the screen, and a fun, upbeat soundtrack that is sure to get you grooving. The design is really simple, and rather than boring the user, the game’s simplicity only enhances your enjoyment. Out of Brakes takes place on a straight, unending track, and is controlled by finger tapping. Simply tap the screen to direct your vehicle where you would like it go. Anyone can play Out of Brakes: as long as you are able to tap at a screen, you are able to enjoy this game! As you progress further into the game, you will have to avoid the obstacles that appear in the middle of the road. If you collide into an orange road barrier, your vehicle will careen across the track for a moment, but you will be able to regain your control and keep driving. 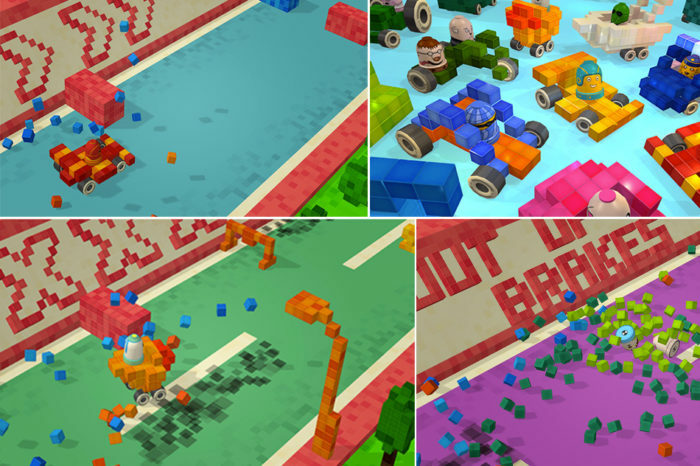 Crashing into red blocks, on the other hand, will cause your vehicle to break into pieces and force you to restart from the beginning of the track. Other blocks that cover the road will benefit you: drive through the blue water barrels in order to increase your speed and help you reach a new ultimate speed score! As you gain speed, it becomes more difficult to efficiently control your vehicle! You must tap quickly, and remain very aware of what obstacles lay ahead of you. By making you work to avoid crashing into obstacles, Out of Brakes can help you to improve your reflexes. And when you do crash, it’s a bit of a reward in itself. Out of Brakes features a precise physics engine: that means when your vehicle crashes, you get to view the impact’s effects as realistically as possible. Talk about cool. The road way is also scattered with coins. Collect these coins in order to gain access to prizes. Prizes can be characters or vehicles. Not only are there tens of vehicles and characters to collect, but each character and vehicle is particularly distinct. Accumulate enough coins in order to win all of Out of Brakes’ possible characters and vehicles! Dying to collect more vehicles, and not feeling like waiting around for your prizes? Vehicles can be purchased for just 99 cents each through the app store. Not only are all vehicles and drivers visually different, but all drivers and vehicles also have different specialties and statistics. For example, I love driving the shopping buggy- it’s small size makes it easy to maneuver past obstacles. The cart, on the other hand, is perfect for the user looking for a little bit more of a challenge. This vehicle is a single wheeled automobile, and it bounces as you drive it, which offers a fun, diverse challenge. My other favorite vehicle is the yacht- the visual of directing a giant boat down a speed way is super amusing! Prizes are not the only goodies to be collected. Every five minutes of game play, you are presented with a free gift! A banner full of colorfully wrapped gifts will pop up across the screen, and you will get to choose a gift box to open up. Gift boxes usually contain coins that can help you to receive your next prize more quickly! All in all, Out of Brakes is one of the best free games available in app stores today. Quirky, addicting, and offering endless hours of game play, Out of Brakes is a top of the line game that people of all ages and gaming skill levels can enjoy.